Surely you must have played with a kaleidoscope at some point in your life. The combination of mirrors and colored beads can yield amazing geometric patterns when pointed at light sources and it's a great example of the principles of reflection. Now you can have the exact same experience on your iPhone, with App Cubby’s KaleidoVid. 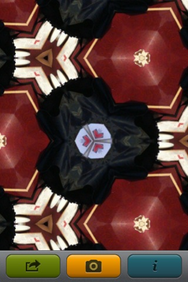 This $1 app mimics your classic kaleidoscope: point the iPhone’s camera at anything to yield swirling, hypnotic geometric patterns. Find one you like? Tap the screen and the image freezes. You can then e-mail the image, save it to your phone’s Camera Roll, or even share it via Facebook or Twitter. There’s a gallery of screenshots on the official site showing off some of the most interesting images that the creators and users have come up with. It’s simple, cute little app from App Cubby, which has in the past brought us Gas Cubby, Trip Cubby, and Health Cubby. KaleidoVid runs on any iPhone or iPod touch with iPhone OS 3.1 or later.